Dear friends. 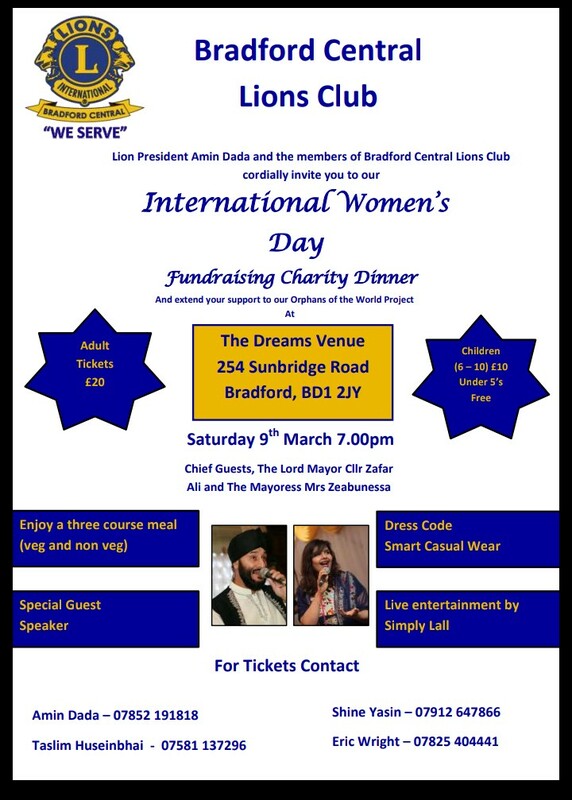 Our project at Bradford Central Lions Club this year (Jul 2018 till June 2019) is to raise funds for the Orphans of the World. We have set a target of £5,000 to help those less fortunate children. So far we have raised a sum of £2,000 and need to raise the balance of £3,000 by 15th June. As you have always supported us in the past we are appealing to you to support us with this project. To this effect we are holding a Fund Raising Charity Dinner on Sat 9th March to raise the balance. See separate flyer for information. 2) Sponsor a part of the event. 3) Make a pledge/donation towards our target. 4) Donate a prize for raffle or an item for auction on the night. Every little helps. Please do support us in our endeavours. Please text me back with what you can help us with.